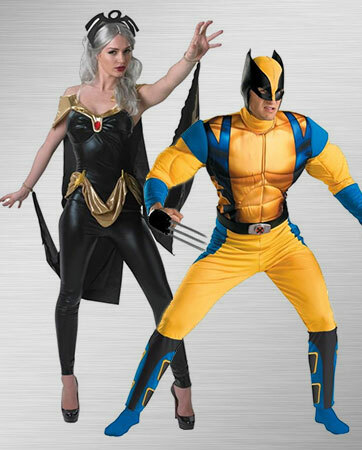 It's never been easier for you, or your child, to look like your favorite superhero, cartoon character, tv or movie character, and more with these Cosplay and Anime Costumes! 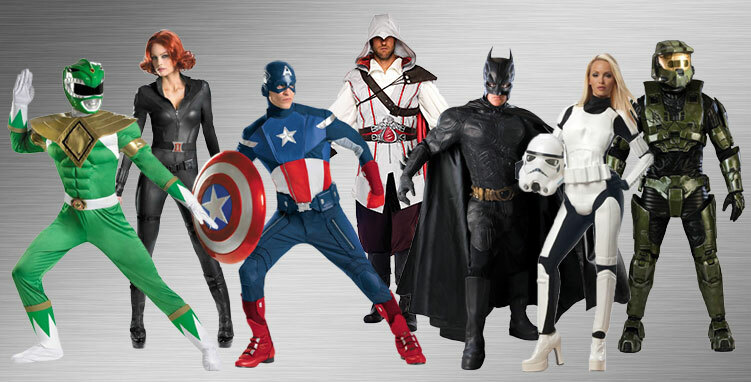 There are tons of different looks for you to choose from this Halloween, including Star Wars, the Avengers, the Justice League, and more, including a huge supply of accessories like weapons, gloves, masks, capes, and more! 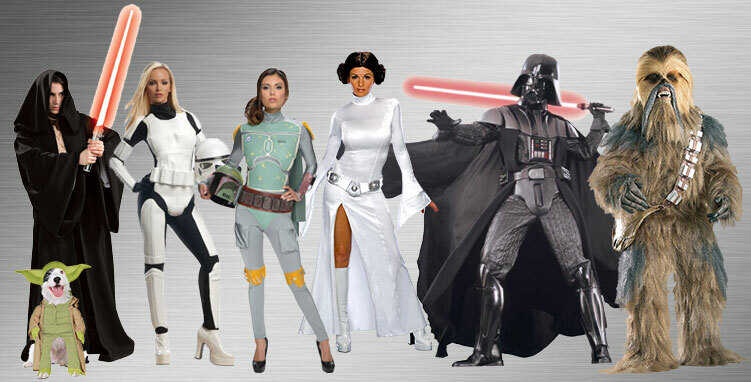 Hit the convention or party in one of our realistic costumes and let the fun begin! Don’t forget to add fashionable accessories sure to inspire your fellow costume players. We’ve got all your favorite characters, so you can always play the role that suits you best. If you want to be sultry and dangerous, try on the costume of a great spy and master of disguise, the legendary scarlet-haired Natasha Romanova, also known as Black Widow. Apparently the Stormtroopers from Star Wars are equal-opportunity employers, so ladies, dress in the oh-so-cool white suit and defend the empire. Guys, you can take a metaphorical dose of super-soldier serum and become Captain America from the Avengers for a day, a week, or whatever. Gamers, if you’re a fan of Halo, put on the green-colored armor and helmet and transform into soldier-extraordinaire Master Chief. Or, impress the ladies and increase your intimidation factor when you masquerade as the formidable Ezio from Assassin’s Creed. For some retro fun, use your special powers (and a great costume) to morph into the Green Power Ranger. Pet costumes are all the rage, so why not turn your party pooch into a canine caped crusader with a cute-as-can-be dogs’ Batman costume? If anime is your passion, then Ash Ketchum is your costume. Pokémon started as a video game and became a worldwide phenomenon soon after. Ash Ketchum is the star of the Pokémon series and was the first character to be introduced. He has always dreamed of becoming a Pokémon Master. So get anime-ted, Poké balls not included. The character of Harry Potter has spawned seven hugely popular novels loved by all ages. This scrawny, black-haired, bespectacled boy didn’t know he was a wizard. He later became the youngest Quidditch Seeker in over a century. If your dream has always been to attend Hogwart’s, this is the costume for you. Dr. Harleen Frances, also known as Harley Quinn, is a frequent accomplice and girlfriend of Batman’s nemesis the Joker. Her name is a play on the word “harlequin,” and it’s quite a romance. She became devoted to the Joker, and became a super-villain. That’s no joke. Kimberly Hart was one of the original five Power Rangers. She was a capable gymnast and was often shown training and using her abilities when fighting against Rita’s forces. She fought with a blend of gymnastic maneuvers, elbows and kicks. And she was pretty in pink. If pink isn’t the color for you, check out our Power Ranger costumes as well! Thor is a fictional superhero from Marvel Comics and a manly man. Based on the Norse mythological deity of the same name, he has the power of flight and weather manipulation, among other superhuman attributes. Thor is the hammer-wielding god associated with thunder, lightning, storms, oak trees, strength and the protection of mankind. Heavy stuff. Master Chief Petty Officer John-117 is a SPARTAN-II commando of the UNSC Naval Special Warfare Command. He is the face of the Halo video game series and is best described as a towering, cybernetically enhanced super soldier. He is never seen without his green-colored armor and helmet. Spider-Man can cling to most surfaces, shoot spiderwebs using wrist-mounted devices called web-shooters, and react to danger quickly thanks to his spider-sense, which enables him to combat his foes. The female version with equal abilities is Spider-Girl. 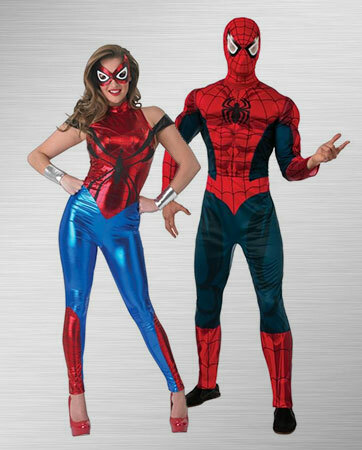 We’ve got both versions, so get these costumes and become your favorite crime fighting superheros. Batman and Robin. They were the dynamic duo that possibly had the first bromance ever. Fighting crime together will do that. 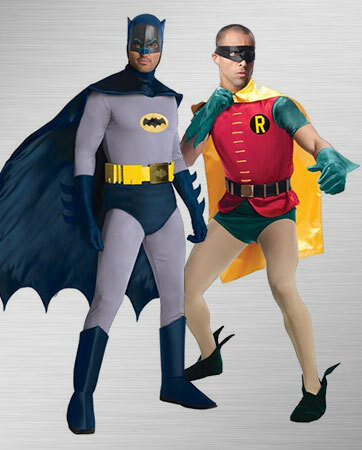 For loads of retro fun, don the classic costumes from the 1960s TV show, when they were still the Caped Crusader and Boy Wonder. Wham! Pow! 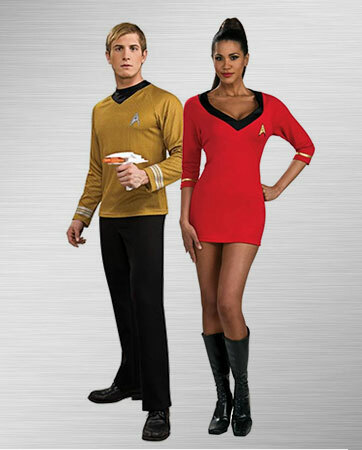 Fans of the original Star Trek TV series will covet this costume based on the red dress worn by communications officer Lieutenant Uhura. Whether you’re headed to a party or the Final Frontier, this Captain James T. Kirk iconic gold shirt with Starfleet symbol is instantly recognizable to Trekkies and non-Trekkies alike. He’s got the sideburns, the retractable Adamantium steel claws, the animal-like senses and the muscles. Wolverine is the most popular member of the X-Men. And who does he turn to in times of trouble? His X-Men teammate Storm. She’s got the mutant ability to control the weather, plus the coolest hair ever. 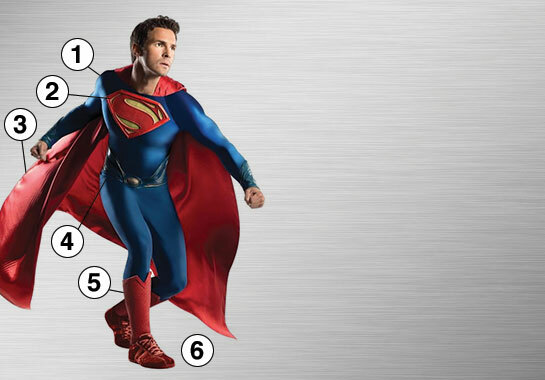 Become the most beloved superhero in history with the Man of Steel Gran Heritage Superman costume! This costume has the details and features that will set you apart from the other posers from Krypton. The Superman Grand Heritage costume features a red and blue jumpsuit with belt in the classic Superman style. The iconic red and yellow “S” logo is emblazoned on the chest in 3D style. The attached boot tops and matching long red cape are red, while the molded belt is blue for a classic contrast. The officially licensed ensemble includes jumpsuit with attached boot covers, cape and molded belt. Just add the boots. Captain America wears a costume with an American flag motif, and he's armed with a nearly indestructible shield that he throws at foes. The superhero is the alter ego of Steve Rogers, a man who was trapped in ice and survived in suspended animation until he was revived to became the long-time leader of the Avengers. 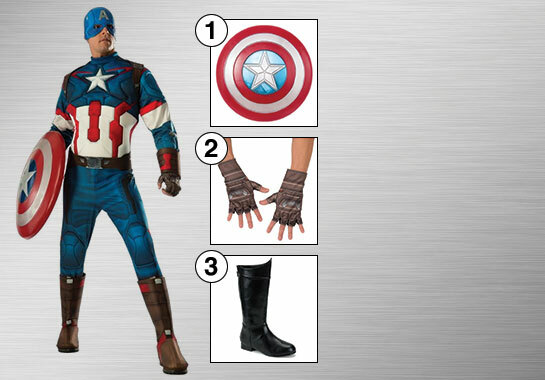 This officially licensed Avengers 2 - Age of Ultron Deluxe Captain America Costume for men includes a stitched deluxe jumpsuit with attached boot tops, belt and mask. Then just add the extra accessories that give it the wow factor: a red, silver, and blue shield, durable polyurethane boots and Age of Ultron fingerless gloves.